Note that each of these patterns has exactly three dots, with one dot in each row and each column. The six overlays shown are the only 3×3 grids that have this property. Your task is to assemble a subset of the overlays and lay them on the template in such a way that dots cover all the colored squares but none of the blank squares. You are welcome to superimpose multiple dots on any colored square, but overall you want to use as few overlays as possible. To make things interesting, I’ll suggest a wager. I’ll pay you $3 for a correct covering of a 3×3 template, but you have to pay me $1 for each overlay you use. Is this a good bet? Before going further, I should mention that not every conceivable template can be covered under these rules. To take an obvious example, no 3×3 template with fewer than three colored squares can possibly be covered by any combination of the six overlays. But I promise to submit only templates that can be covered by some combination of the given dot patterns; if I err about this, I forfeit the bet. How does the game play out? If I give you the template marked “1″ above, you can easily win; just choose permutations a and b, which together cover all the colored squares and no others. You pay $2 and get $3. Template 2, with all nine squares colored, looks like it might be the toughest challenge. Clearly, it cannot be covered with fewer than three overlays, since we need a total of nine dots; and it turns out that exactly three overlays are required. Indeed, there are two ways of covering the template with three overlays: a + d + e and b + c + f. Thus this template is a breakeven proposition: You earn $3 and pay $3. Now we come to template 3, which has eight colored squares and one blank. Surely if you can cover the full nine squares with just three overlays, then you should also be able to cover eight squares—no? I invite you to try it. In fact the only covering that works requires four overlays: b + d + e + f. Thus you shouldn’t take my bet, since I can always give you a template with just one blank, and you’ll have a net loss of $1. A permutation matrix is a square matrix with a single 1 in each column and each row, and all the rest of the elements 0. Given an ormat, the total number of distinct permutation paths that can be threaded through the 1 entries of the matrix is equal to the permanent of the matrix. Calculating the permanent is known to be a hard computational problem. The permanent tells us the maximum number of different permutations that can be OR-summed to produce a given ormat, but what is the corresponding minimum number? Also, in how many different ways can the minimum be achieved? The connection between ormats and my little game is probably apparent by now. 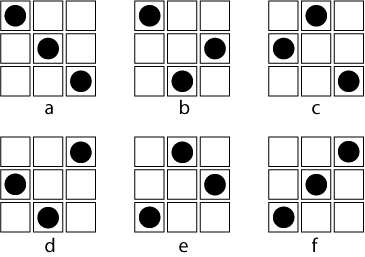 The template of colored and blank squares is an ormat; the dotted overlays represent permutation matrices; to maximize your payoff in the game (or to minimize your loss), you need to answer Barry’s first question, finding the minimum number of permutations that can be combined to yield the given ormat. Some of the numbers on this card are easy to explain. The six ormats with just three 1 entries are the permutation matrices themselves. There are six of them because there are 3! = 6 permutations of three things. There are no ormats with four 1 entries for a reason that bears thinking about: There can be no permutations that differ from one another in just one element. When you superimpose any of the six overlays shown above, you can wind up with three, five or six dots, but never four. At the other end of the scale, it’s no surprise that there’s exactly one ormat with nine 1 entries, and that it takes three permutations to produce it. 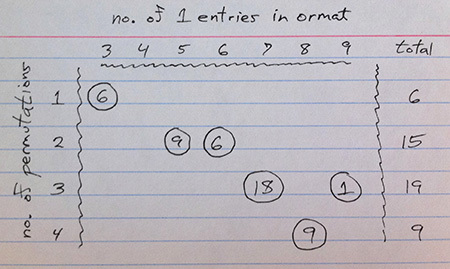 And then there are the nine ormats with eight 1 entries, which each require four permutations to be OR-ed. These are the single-blank patterns like template 3 above. Based on these results, I began speculating about what I would see in a tabulation of all 4×4 ormats. There would have to be 4! = 24 patterns with four 1 entries, and just one pattern with all 1s, generated by OR-ing four permutations. And there should be 16 ormats that require five permutations, namely the 16 matrices with a single 0 element. This last prediction seemed a little less self-evident than the others. Pocket change and Cheerios. My thoughts about the single-zero (or single-blank) case went something like this. To cover 15 squares with sets of four dots each, we need at least four sets, or else we simply won’t have enough dots. So a useful starting point is one of the optimal arrangements that cover all 16 squares without gaps or overlaps. 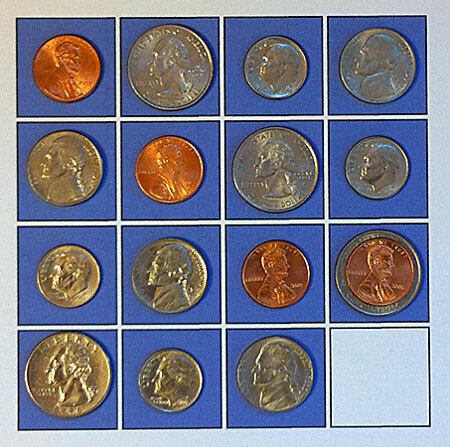 By this time I had grown tired of drawing zillions of dots, and so I started working with sets of coins. 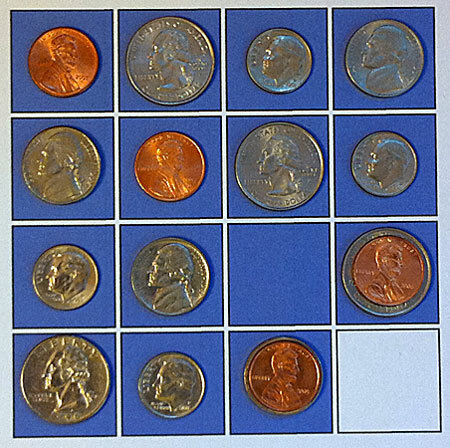 In this arrangement each coin denomination forms a permutation, with no two pennies, nickels, dimes or quarters in the same row or the same column. We have successfully covered all the colored squares, but unfortunately we’ve also covered the blank at the lower right. Thus this pattern of coins is not an acceptable solution, but maybe we can fix it up somehow? 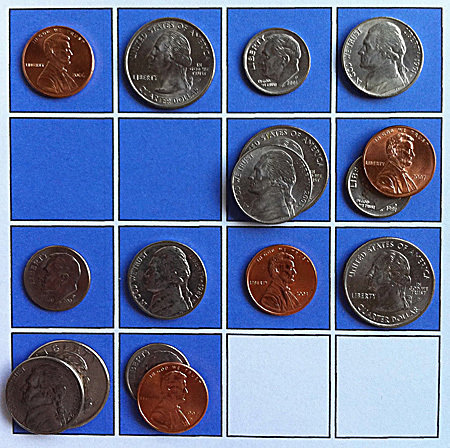 Moving the penny from the blank square to another square in the same column solves one problem but creates another: Now the arrangement of pennies is no longer a permutation. 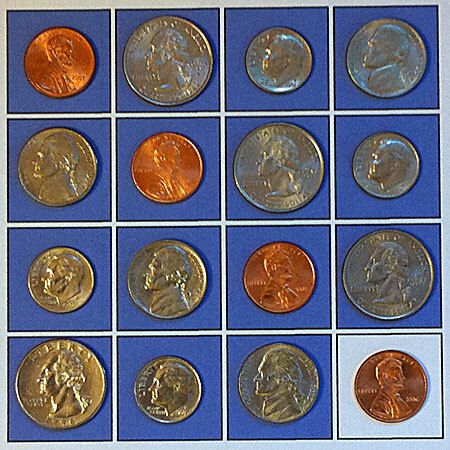 There are two pennies in the third row. There’s nothing special about the particular moves I chose in this sequence. 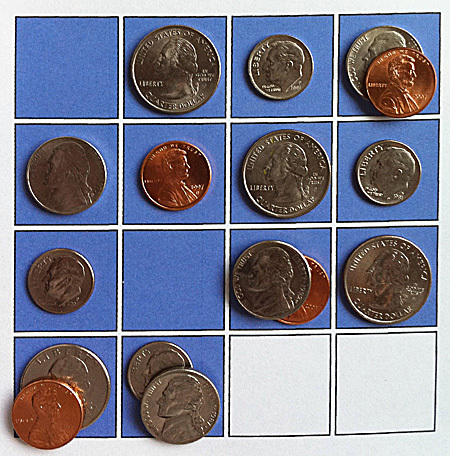 If you try some alternatives, you should be able to persuade yourself that moving the penny that covers the blank to any other square in the fourth column (or in the fourth row) would lead to essentially the same situation. Likewise the game would come out the same if the single blank square were placed anywhere else in the grid. And you could also start with a different set of initial permutations (provided they cover all the squares). This coin-shuffling exercise demonstrates that we can cover any 4×4 template that has a single blank by combining no more than five permutations, but how do we know that five are actually needed? Maybe there’s some totally different arrangement that would do the job with just four permutations? Well, think about what such an arrangement would look like. It would have to differ at exactly one position from some other layout of permutations that covers the full 16-square grid. But no two permutations can differ at one and only one place. Thus the reason there can be no four-permutation cover of 15 squares is essentially the same as the reason no 4×4 ormat pattern can cover just five squares. This argument generalizes to k×k matrices: For any integer k, there must be at least k ormat patterns that cannot be covered with fewer than k+1 permutations. But then comes the bigger speculative leap: Perhaps k+1 is an upper bound. Perhaps part of the answer to Barry’s question is that no k×k ormat pattern requires more than k+1 permutations. At one point I even had a “proof” of this conjecture. Then I wrote a program to check it, doing much the same thing I did with the dots on the airplane. Out of bounds. My program found the expected 16 ormat patterns that require five permutations—and it found many more as well. In all it identified 2,032 4×4 ormats that can’t be composed from fewer than five permutations. And then came a bigger surprise: The program also found 480 patterns that require six permutations. So much for my proposed upper bound. Looking over this pattern, I thought I understood where my earlier reasoning had gone awry. This matrix is just like the single-zero pattern, but with two zeros! (I do mean for that statement to make sense. Bear with me.) Suppose we start again with a set of four permutations that completely cover the grid, including the two blanks. 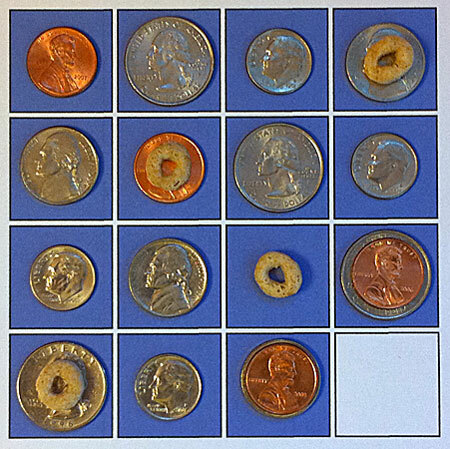 Inevitably, when we uncover the two blank squares, we also remove coins from two colored squares, which now have to be filled in again. The key point is that no single permutation can repair that damage, because the two open colored squares are in the same row. To cover both of those squares we need two additional permutations. 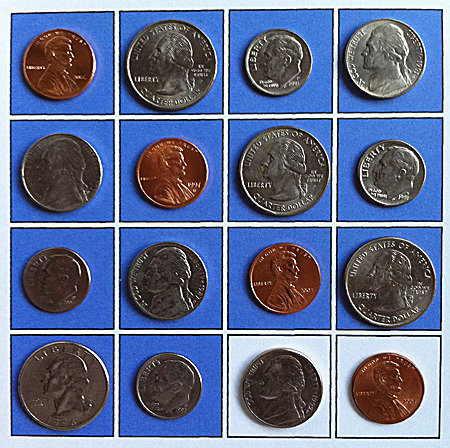 Other ways of reshuffling the coins avoid putting the two open squares in the same row or column, but they still foil all attempts to complete the covering with just five permutations. Try adding four Cheerios to the diagram below. If you cover both of the open blue squares, then either you also cover one of the blank squares or you wind up with two Cheerios in the same row. Update 2010-08-19: No takers for my bet, eh? Too bad; I had already spent my winnings. So as not to abuse existing matrix terminology, I’ll call any (square) matrix of this type—i.e., whose entries below the main subdiagonal are all 0—”uppity triangular.” I can (and will!) show that this uppity triangular ormat for k=7 requires (at least) 16 permutations—and the number appears to grow concavely upwards from that, so I, for one, will definitely not take you up on your $2k wager. The trick, I realized, is to view each ormat as the “shadow” of what I’ll call an “addmat.” If you let P1, P2, …, Pr be k×k permutation matrices, their addmat is simply the ordinary result of addition: S = P1 + P2 + … + Pr, whose entries are positive integers wherever one or more of the constituent permutations has a 1 and otherwise 0. The associated ormat is obtained by changing each of these entries to a 1, while leaving the 0′s alone. 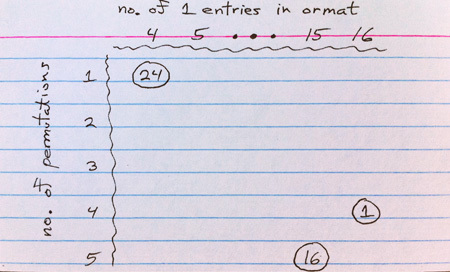 In this sense, the ormat’s 1′s are the “shadows” of the addmat’s positive entries. What’s crucial is that addmats have a lovely little property not shared with their shadows: the row and columns sums of the entries of an addmat all equal the number of permutations that produce them, r.
where a, b, and all the *’s are positive integers. In particular, each * is at least 1. Since all row and column sums must be equal, the sum a+b must equal the sum of b and all 6 *’s above it. Hence a is at least 6. Likewise a+b must equal the sum of a and all 6 *’s above it, so b is also at least 6. Hence a+b is at least 12, which means the OR-sum that produced the given ormat involves at least 12 permutations. where I now wish to call your attention to the entry labeled “@”. To make its row-sum equal 12, we need @ = 10. But that means its column sum (with the 5 *’s above it) is at least 15, which cannot be! So we are forced to try larger values of a and/or b—which is to say, we need more permutation matrices to produce this addmat. This matrix also requires 16 permutations for a proper covering. To see why, try threading permutations through the columns of the matrix, starting at the left edge and in each column choosing a 1 element (never a 0) from a different row. Because of the block of zeros at the upper left, the first three elements of every permutation must lie in rows 4 through 7. Thus each permutation “uses up” three of the last four rows in the first three columns, and the rest of the permutation can revisit this range of rows only once. It follows that each permutation can touch only one element in the 4×4 block of 1s in the lower right corner of the matrix, and at least 16 permutations are needed to cover all the 1s in the matrix. Showing that 16 are sufficient is not hard. These results give us a lower bound on the upper bound on the number of permutations that may be needed to cover a k×k ormat. But we haven’t proved it’s the true upper bound. Are there other ormats that require even more permutations? My guess is no, but keep in mind that almost all my conjectures along these lines have turned out to be wrong. This entry was posted in computing, games, mathematics, physics, statistics. Brian, are you now conjecturing that all your conjectures turn out to be wrong? Your flag-waving approach is much much better than my uppity triangular idea. It gets to a good general result without any messy case-by-case analysis. Well done! To answer Barry’s question, yes, if all the row and column sums are equal, then the matrix is a sum of permutation matrices. The result goes back to Konig, 1915/16, and can be seen as a consequence of Hall’s Marriage Theorem. See D Leep and G Myerson, Marriage, magic, and solitaire, Amer Math Monthly 106 (1999) 419-429.